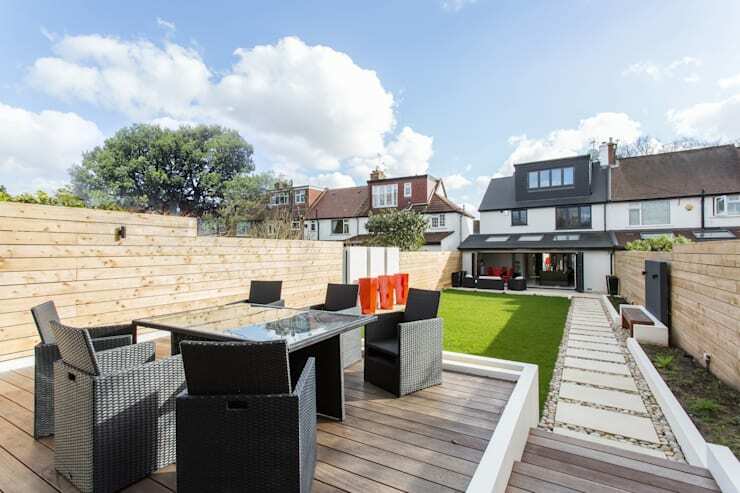 The architects at GK Architects Ltd bring you a fascinating terraced home in West London today. 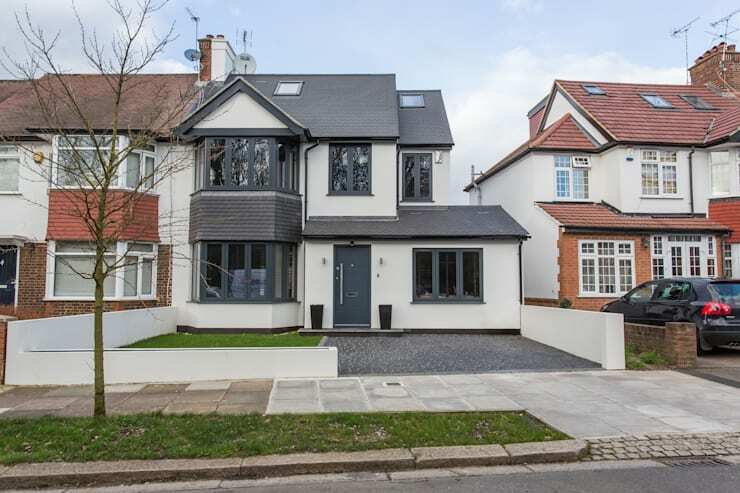 Situated on Whitton Drive, right next to the Sudbury Golf Club, the house was planned and designed to serve as a beautiful and cosy family abode. From furniture, to lighting, finishing and landscaping, everything was supervised and implemented meticulously for a stunning impact. A traditional but elegant facade will lead you inside to reveal a stylish living space, bright and airy dining and kitchen, a chic bedroom, and a breathtaking garden. 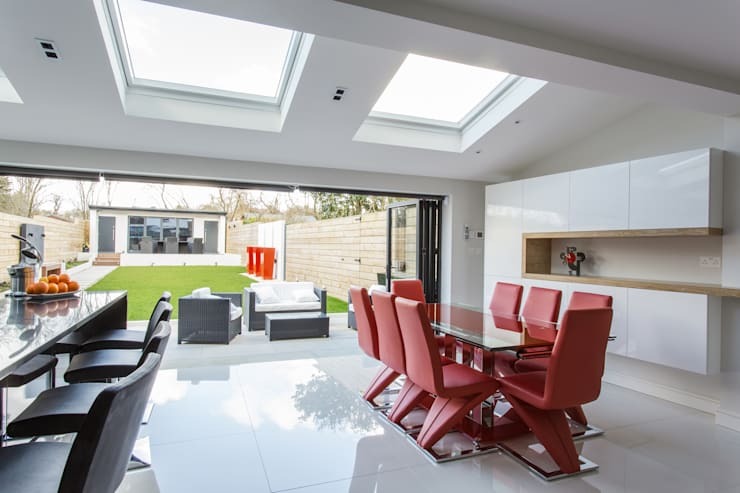 Sleek elements, glossy surfaces, and smart use of glass doors and skylights give this home a special appeal. Despite the familiarity in design and structure that it shares with neighbouring houses, this facade stands out owing to its monochrome palette. Bay windows and elegant sloping roofs add to the charm of the house. 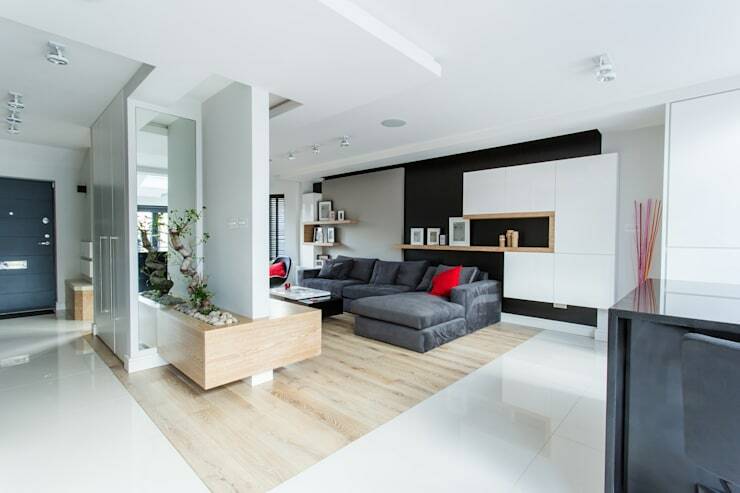 Grey, white and wooden hues come together in this stylish living space for a modern and practical ambiance. 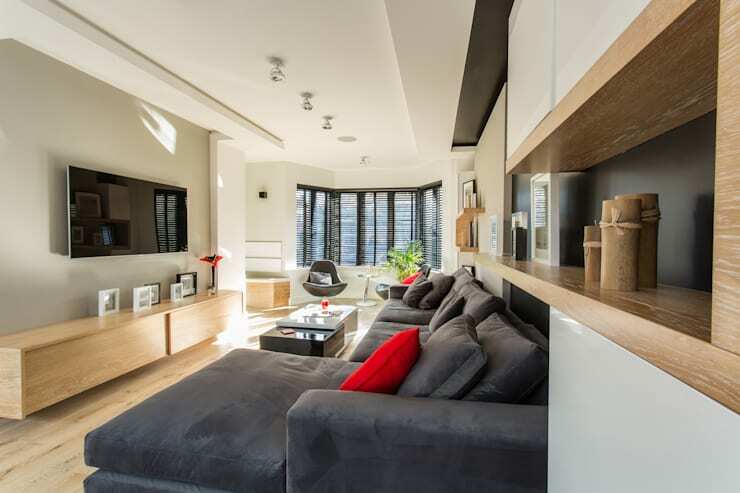 Pops of bold red add spice to the setting, while sleek storage units make the overall appearance smart. We love how the wooden flooring demarcates the living zone from the rest of the house, by contrasting the gleaming white tiles surrounding it. The wall that holds the TV for the living room accommodates sleek floor to ceiling cabinets on the other side for smart storage. It also features a tall mirror on the side for a glamorous feel and to make the interiors seem more spacious. Grey and white pair with a warm wooden floor, for a timeless look in the minimalistic bedroom. The bay window brings in tons of natural light, while a single large artwork adds visual appeal to the space. It’s inspiring how the interiors open up to the lush green garden through folding glass doors. This ensures seamless integration of the insides and outsides, besides ample ventilation. 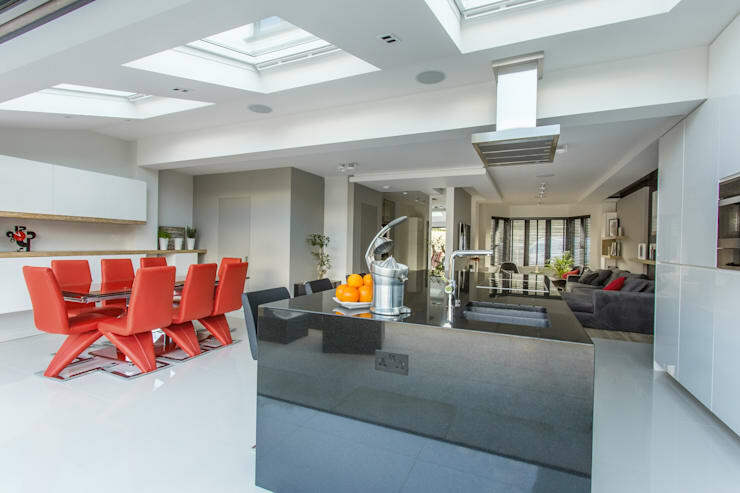 The large skylights allow sunlight to flood the gleaming kitchen and dining areas as well. Bold red futuristic chairs surround a glass and chrome table for fun mealtimes, while sleek cabinets offer storage space. A glossy and smooth black island adds a bold touch to the shiny white open kitchen, while modish appliances make cooking a dream. In-built white cabinets house all kitchen essentials, while some trendy chairs accompany the island so that guests can socialise with the guest. The owners are fortunate enough to have an expansive and verdant garden with stylish wooden fencing on either side. An open air lounge close to the house allows you to relax with loved ones; while a rattan dining arrangement at the other end of the property lets you enjoy outdoor meals. 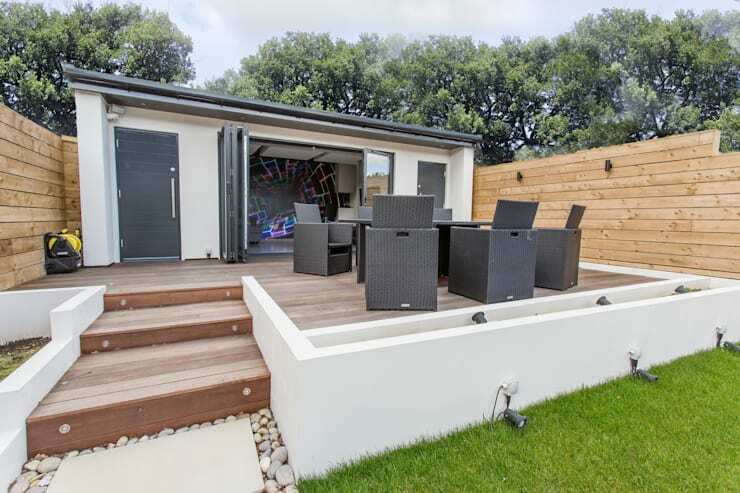 The compact and contemporary garden shed right next to the outdoor dining arrangement is perfect as a den, games room or storage space for garden tools. Smart wooden steps lined with pebbles lead you to the raised deck here, while the white and grey combination on the shed impresses with its elegance. 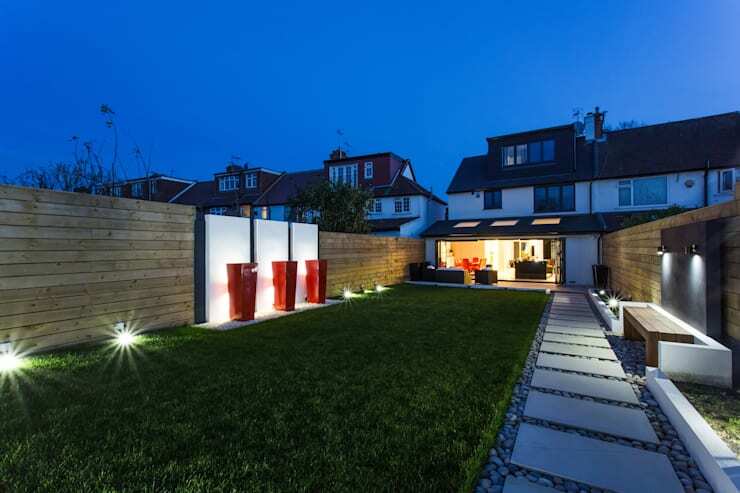 After the sun sets, the garden looks simply magical with its bright yet soothing lights, neat pavers and lush grass. The tall and bold red vases add a dash of colour, while a slim wooden bench beckons you to sit and relax. This beautifully rendered terraced house is a comfy, sophisticated and nature-friendly place to live in. For more ideas, take another tour - This Home Is Sustainable With Style.